When it comes to designing and creating built-in cabinets, Allen’s Built-in Cabinetry makes sure it’s all about you. Your style. Your taste. Your likes and dislikes. Tailored specifically to all of these things, mirroring you and the lifestyle that you live. Located just south of London, Ontario, on Wharncliffe Road South in Lambeth, Allen’s Built-in Cabinetry is a team of accomplished cabinetmakers, woodworkers and administrators whose sole purpose is to make their customers happy with the furniture they create on their behalf. Using quality wood products with the most up-to-date technology available, the options you have to choose from when designing the perfect built-in from Allen’s are limitless. When Darío García Cabezas and Elias Polizoes teamed up in 2012 to open The Wood Studio in London’s SoHo District, they had a clear goal in mind – that of combining impeccable craftsmanship, a sharp focus on design, and made-to-measure functionality in order to create custom millwork solutions for the kitchen and bathroom. Dozens of projects later, Darío and Elias continue to build strong relationships with their clients, providing a personalized boutique experience that results in customized outcomes at competitive prices. Our inspirational design team and certified kitchen and house designer work with you to ensure ideas are understood and that your lifestyle needs and budget match. Wm. E. Tyssen Furniture & Millwork Ltd.
Wm. E. Tyssen Furniture & Millwork Ltd., is a progressive and service oriented company. Currently, we manufacture and install custom kitchens and living spaces throughtout Canada and the U.S. Projects we include in our portfolio range in size from homes of 15,000 square feet to residences of 2,000 square feet. We have worked with North America's leading Designers and Architects to help clients realize their vision. Bill is personlly involved with every stage of the project from inception to hands on installation. Our team uses old world craftmanship to quarantee our bench built product exceeds your expectations. We deliver quality product for living spaces that are inviting and functional for your lifestyle. We Take great care in creating custom cabinetry you'll love! We build Kitchen and bathroom cabinets, Entertainment units and whatever else you can dream up! We also provide custom built mennonite furniture, Tables, Chairs and bedroom furniture. Remodeling in Windsor? Find an Urban Effects Dealer Near You! From contemporary to transitional to traditional, Urban Effects Cabinetry has your style covered. We make the cabinets that make your dream kitchen and bath a reality! Paul Cooper has been building kitchens, vanities and built in cabinetry since 1984 in the South Western Ontario area. His well equipped shop has the capability to produce any type of wood working project. We are experts in design and manufacture of high end cabinet doors for kitchens. We work with your contractor or designer to supply custom cabinet doors that will fit your unique taste and design. At Wellington Millwork our greatest achievements are only met by your standard of approval. We pride ourselves on using your ideas and initial concepts with our skills, knowledge and craftsmanship to create unique flawless cabinetry for your everyday living. Using the best materials on the market we can bring to life any type of cabinetry that you may desire, whether contemporary or traditional, rustic or elegant. We started this cabinet company for the love of it. Each of us comes from different sectors of the cabinet-making industry bringing our own valuable knowledge to each project. We pride ourselves on using your ideas and initial concepts with our skills, knowledge and craftsmanship to create unique flawless cabinetry for your everyday living. Jem-Dor Woodcraft Limited was founded by Herman Dougherty in 1975. Herman was a believer in building quality products at affordable prices. Starting with a very small shop and armed with a few door samples Herman led Jem-Dor Woodcraft Ltd. to becoming one of the most well-known and respected manufacturers of custom kitchens in London. Upon his passing, the torch was passed to his son Ron Dougherty who had been brought up in the business. Along with his mother Sylvia, Ron successfully kept his father’s dreams alive and continued to grow the company’s reputation for servicing the London market with the highest quality custom cabinetry. With over 8 years of experience, we provide clients with custom & distinctive cabinetry & furniture design. We offer exceptional quality & craftsmanship for both residential & commercial clients! The pride that our talented employees have in their work, and their commitment top producing quality products for our clients, is what makes Dynamic Kitchens what it is today. Woodecor Ltd. is a complete custom cabinet manufacturer located in Stratford, Ontario. Building off of the outstanding reputation of Lloyd Vandenberg, Matt Anderson and his team continue to provide Southwestern Ontario with top quality service and products for all your cabinetry needs. For over 30 years, Woodecor has had a reputation for supplying the finest woodworking to the residential, commercial, and industrial sectors. Our design style adapts to suit your needs, offering innovative designs in traditional, transitional, and contemporary while always creating an everlasting, timeless product. JH Kitchen Cabinets offers factory direct, custom made designs to suit your needs. Unlimited coloring options, no pre-staining, you are not limited to what has been prefabricated. Huge Mattress Sale! Need better sleep? Warehouse Guys Windsor specializes in bringing you Affordable Elegance with the quality you deserve at wholesale prices and utilizes Choice Cabinets as our premier supplier of all wood cabinets. To a craftsman, wood is a work of art, waiting to take shape. An idea, looking for expression.... At Woodland Horizon, we strive to bring that creative inspiration and craftsman’s touch that makes each custom Kitchen, built in Cabinetry or Stair a work of art. Whether we build in rustic hickory, refined ash, or exotic mahogany, and whether the finished product is stunningly contemporary or distressed, antique reproductions, our commitment is to creativity and excellence. From our selections of wood, to our traditional building methods, to our durable finishes, our entire process is focused on quality. Truly solid wood cabinetry, Stairs and more, reflects one of the most authentic, durable consumer products in use today, and one of the most permanent. Our goal is to bring you end products that are crafted with creativity. We love to design with creativity, and our craftsmen love the unique challenges that each distinctive, custom piece brings. This creative approach ensures that your end product can be distinctively beautiful—a masterpiece that is uniquely yours. If you want your cabinets to become a work of art, contact us at (519) 638-5961 or click the "contact me" button on top of the cover photo. We look forward to working with you! At Woodland Horizon, we strive to bring that creative inspiration and craftsman’s touch that makes each custom kitchen a work of art. Superior custom cabinetry created by a team of highly skilled craftsmen. No cabinetry design is too custom for our team. We will design and manufacture a completely new concept for your space, giving you the exact style and function you desire. The focus here at Homestead is centered around designing solutions with wood. It is difficult to properly define the spectrum of work we do; the styles range from rustic, eloquent, country, french country, victorian, modern, turn-of-the-century, and southern, to a combination of any of these. Designs and styles are tailored to capture the expression of each individual. Homestead’s portfolio is continually growing in order to meet the needs of each client. As we work with new clients with a variety of needs and desires, our boundaries continue to be stretched to new horizons. Homestead Woodworks has grown over the years by acquiring craftsmen who are experienced in many different areas of woodworking. The latest additions to our products are front entrance systems, interior doors, specialty staircases and trim. These additions complement our main line of kitchens, built-in cabinetry, and furniture. We look forward to working with you and the challenges and opportunities for growth that your project may bring us. We provide full-service kitchen construction and remodeling services for residential clients in the GTA Area. We always strive to meet and exceed the goals of our clients. Since 1976 Leeds Cabinets Ltd. have taken great care and pride in designing and manufacturing the finest quality custom kitchens, as well as any other project we have had brought to us. We strive to produce a high quality product that meets the needs, wants, and expectations of our clients at a fair price. Elmira Kitchen & Bath Inc. Specialists in custom cabinetry and millwork, and supplier of quality countertops, Elmira Kitchen & Bath Inc. (EKB) is Waterloo Region’s go-to for exceeding expectations in crafting beautifully designed spaces throughout the home. Classic and on-trend designs, paired with quality craftsmanship, guarantee stunning transformations that will withstand time and wear. Quintessential to the company’s success is its partnering with trusted and skilled trades, and reputable suppliers. With a 99% customer referral base, EKB’s reputation for building and maintaining strong customer relationships is at the core of this family owned and operated company. With nearly 20 years of excellence, you can trust Elmira Kitchen and Bath Inc. with your next custom design project. Since we first opened our doors, we have been one of the “go to” kitchen and bathroom design companies in Southwestern Ontario. We have designed and installed thousands of kitchens, baths, and bars. 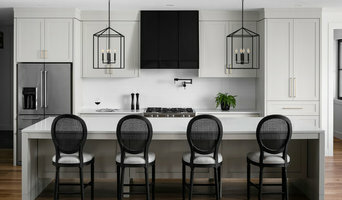 Greater Toronto's Custom Kitchen & Cabinetry Designs-3X Best of Houzz! When you think about cabinets, your mind probably goes straight to kitchens and bathrooms. But London cabinetry professionals’ abilities extend far beyond those obvious spaces. If you need built-in storage, shelving or custom case goods, no matter what the room or purpose, cabinetry experts can help. Their focus on details and space-planning skills can help you squeeze functionality from even the tiniest corners of your London, ON home. In addition, London, ON cabinetry pros can help you give worn or dated cabinets a makeover. They can replace doors; add glass inserts, decorative moldings and other details; or give cabinetry a new coat of paint or specialty finish. Your cabinetry professional might work closely with an Ontario kitchen designer, builder, remodeling contractor or interior designer. Here are some related professionals and vendors to complement the work of cabinets & cabinetry: Kitchen & Bath Designers, Kitchen & Bath Remodelers, Interior Designers & Decorators, Closet Designers and Professional Organizers, Woodworkers & Carpenters. Find a cabinetry professional on Houzz. Narrow your search in the Professionals section of the website to London, ON cabinets and cabinetry. You may also look through Ontario photos to find examples of cabinets that you like, then contact the cabinetry professional who worked on them.